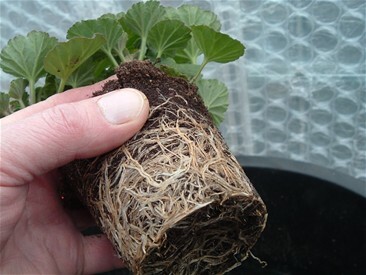 Below you will see photos of a 2 year old Miniature Stellar and a Miniature Zonal, which have become pot bound. This is how I give them a new lease of life. 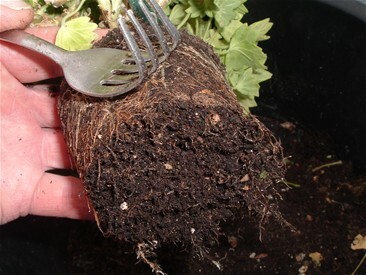 I remove about an inch from the bottom of the old root ball, to do this I use a bent fork, gently teasing away the old compost. I find this works better for me, than using a knife to cut it off. I do my plants from the last week of February, and spread it through March giving all my older plants the same treatment if needed. 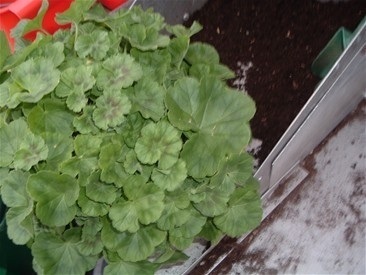 This also gives me the chance to drop the plant down in the pot, as this helps cover any old wood. 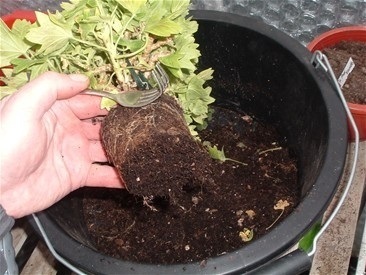 Then any space at the top of the pot is filled with fresh compost. This is the 2nd year Miniature Stellar that I did the last week in February. 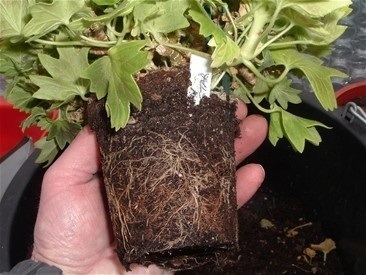 I took the photo 3 weeks later to show that there are now new roots showing at the bottom of the pot. 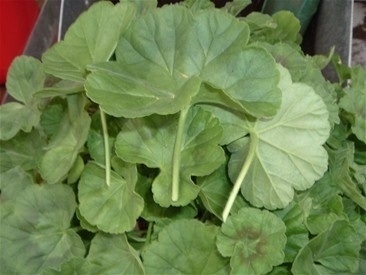 The leaves on Dwarfs and Miniatures have to be in keeping with the size of the plant. In this photo you can see a big leaf on a plant of Bold Carmine, this is best removed so that points are not lost on the show bench. You can see just how much bigger these leaves that have been removed are, the leaves that are left will soon fill any gaps. 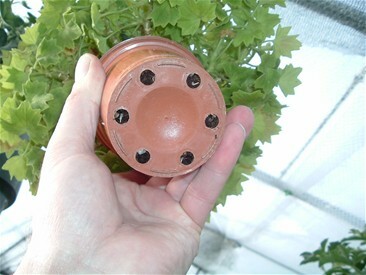 Just remember that the foliage on any Dwarf must not exceed 7" in height from the tim of the pot, and Miniatures 5". 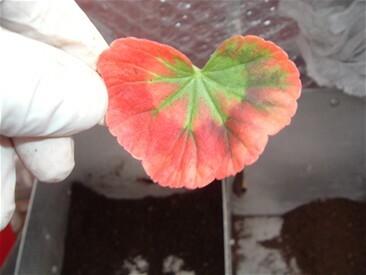 This leaf show signs of the change in temperature, caused by the winter and early spring sunshine. I find the worst affected are some of the Dwarfs, such as Clatterbridge, Brackenwood and Dibbinsdale. Stellars can also suffer, as do some Miniatures. 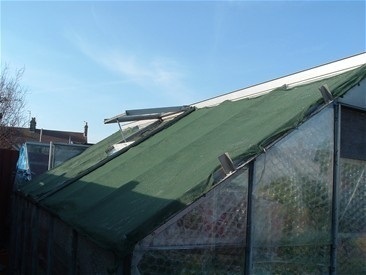 I try to avoid this by moving affected plants to a part of the greenhouse that does not get so much SUN. 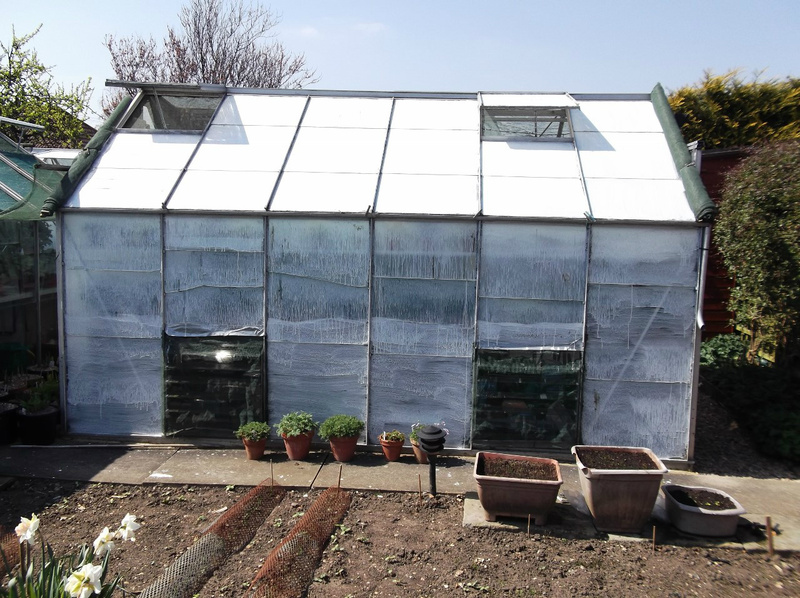 Another thing I do, even though I have bubble insulation in at the moment, is to shade the greenhouse when it is really sunny. This does help a lot in keeping temperature down, which in turn goes a long way in preventing more red leaves. 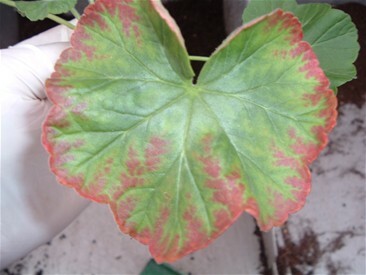 The redness does not grow out, so any affected leaves have to be removed. When the bubble insulation is removed and the weather is warming up with plenty of sun, I use shading to protect the plants. As you can see in the photo I take the shading right down to the base of the greenhouses, rather than stop at the level of the staging. I find this helps to take the temperature down an extra degree or two. The shading I use is vari-shade-reactalite based, is either Nixol or Growing Success Greenhouse Shading. I much prefer these to Cool Glass as once it gets wet it goes clear letting in more light.